Modeled after Maria Shriver’s Just Who Will You Be, Queen Latifah’s goal with Put On Your Crown is to help young women build a strong sense of self-esteem. A US Dept. of Justice survey found that females ages 16-24 are more vulnerable to partner violence than any other group, almost triple the national average. Cases like Chris Brown’s assault on pop star Rihanna showed an ugly side of adolescent life. However, Queen Latifah has always been a shining example of a woman happy with herself and unwilling to compromise to fit into the “hollywood ideal” of what a confident beautiful woman should look like. I love Queen Latifah. There’s something about her that just makes me want to know her and in some ways be like her. A confidant plus size woman who knows what she wants in life and goes for it. That’s why I jumped at the chance to review her new book. It’s funny, as I was reading this book I could hear Queen Latifah’s voice in my mind. This book is about empowerment and being a strong, powerful, confidant woman~ being smart about everything in life from love to money to Â beauty. I think this is a great little gift for any young woman in your life~ it’s about taking charge of your own life and “owning” every choice and decision you make along the way and how to make those choices wisely. She does this by sharing stories from her own life and teaching us through what she has learned so far on her own journey. Thanks Ms. Queen. I will be re-reading this book again… and again. I love Queen Latifah! I’d love to read this book! .-= Sarah´s last blog ..Jazzys Crochet Pot Scrubbers Review & Giveaway =-. I really admire Queen Latifah and would love to win this book! .-= Suzanne L.´s last blog ..Ravished by a Highlander by Paula Quinn… A Review and a Giveaway! =-. I Follow your blog through an email subscription! I just became a follower on Google Friend Connect! 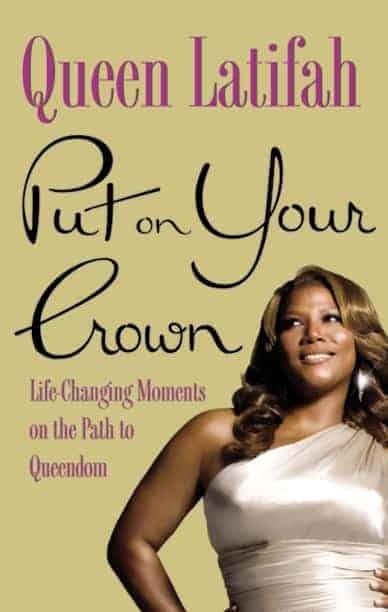 I like Queen Latifah, and look forward to reading her book “Put on Your Crown”. .-= Sarah´s last blog ..Giveaway Roundup! =-. Luv to read this one…I like the Queen, thanks. This book sounds very interesting. I would love to read it. I have always enjoyed her music and movies. Please enter me. Thanks! Dana Owens is one of my favorite performers. I love queen latifah & would love to read this~! .-= Surge´s last blog ..Bentley’s Bones review and giveaway =-. Looks really good,would love to read it! I’ve been a fan of hers since UNITY came out. .-= sarah´s last blog ..Thanksgiving in May: Trade Winds Cafe =-.